Kamika Ekadashi is one of the significant ekadashi vrats that falls on the 11th day of Krishna Paksha (the dark phase of moon) during the month of ‘Shravan’ as per the North Indian Hindu calendar. However in the Marathi, Gujarati, Telugu and Kannada calendar, this ekadashi is observed in the ‘Ashada’ month. In the English calendar it corresponds to the months of July-August. Kamika Ekadashi is also the first ekadashi observance that falls during ‘Chaturmas’, the auspicious period dedicated to worshipping Sri Krishna. It is a day dedicated to worshipping Lord Vishnu and is celebrated with great enthusiasm all over by Hindus, all across the country. It is believed that this holy ekadashi pardons all the sins and the person attains ‘moksha’. Kamika Ekadashi also helps one to be relieved from ‘Pitru Dosha’. On the day of Kamika Ekadashi the devotees must worship Lord Vishnu with full fervour and devotion. People get up early and the lord is worshipped with Tulsi leaves, flowers, fruits and sesame seeds. Later Panchamrut Abhishek is also done. There is also a practice of lighting a lamp in front of the God and ask for forgiveness for all the sins committed. On this day there is a special significance of worshipping Tulsi plant as Tulsiji is considered sacred to Lord Vishnu. Mere sighting of Tulsi leaves on Kamika Ekadashi will wash away all the sins and by offering prayers to Her will eradicate all the diseases. Watering of Tulsi plant will protect the person from the wrath of Lord Yama, the God of Death. So it plays a major role during the Kamika Ekadashi vrat rituals and most of the Hindus plant Tulsi in their houses for this reason. On Kamika Ekadashi, people observe a complete fast by abstaining from drinking or eating anything all day long. If complete fast is not possible then partial fast can also be undertaken. In this eating fruits and milk products is allowed. The ekadashi fast is broken on the next day, ‘Dwadashi’ (12th day) after giving food and donating money and clothes to Brahmins. The observer of Kamika Ekadashi vrat must keep jagran at night and sing kirtans and bhajans in the praise of Lord Vishnu. Reading ‘Vishnu Sahastrsanaam’ and chanting ‘Om Namo Narayana’ is considered auspicious on this day. On Kamika Ekadashi, Hindus also visit pilgrim centres and take bath in various ‘Tirthas’ like Ganga, Godavari, Yamuna, Krishna and Cauvery to name a few. This day is of great importance in Lord Vishnu temples. Special puja, Abhishek, bhajans and aarti are performed on this day. A variety of ‘Bhog’ is prepared for this occasion and offered to Lord Vishnu. 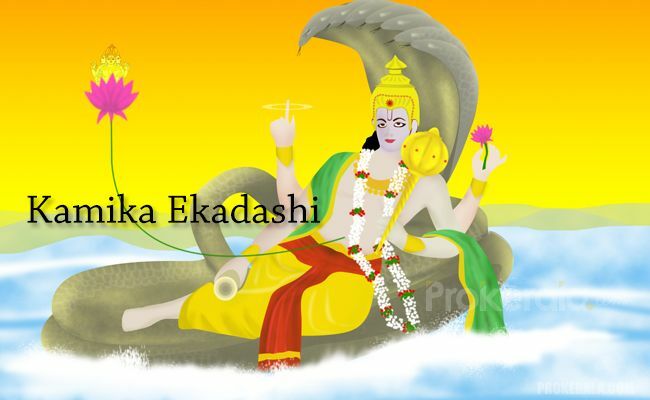 Kamika Ekadashi is an auspicious fasting day of Hindus. It has been cited in the ‘Brahmavaivratt Purana’ that whoever performs this vrat will be benefitted with great values and achieve greater deeds that one receives by hosting various yagnas. The Kamika Ekadashi fast fulfils the wishes of its observer and blesses them with a prosperous life. It also takes them on the path of spirituality that ultimately leads them to the supreme creator. Therefore it can be rightly said that by performing the Kamika Ekadashi vrat the person will never have to tread the path of ‘Yampuri’ and instead achieve a divine place in ‘Vaikunth’, the abode of Lord Vishnu.